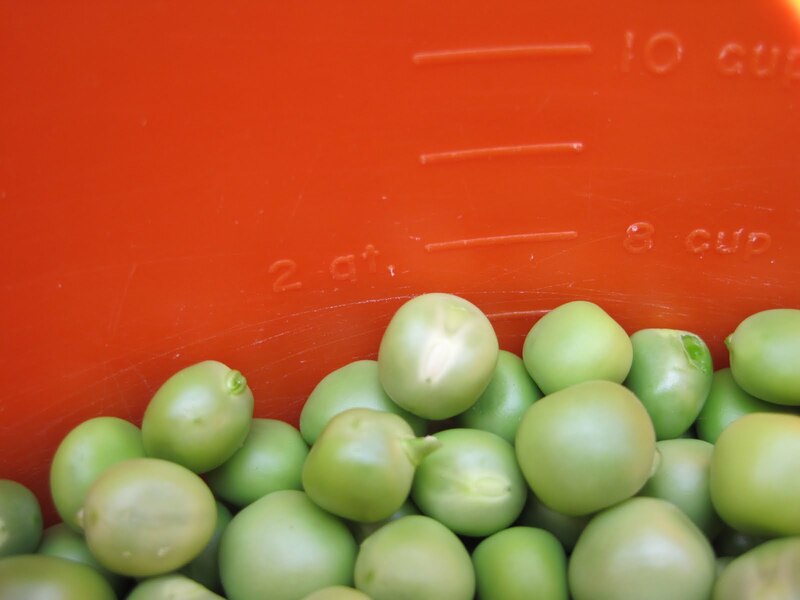 Do you know how long it takes to shell eight cups of peas? I do! I can tell you from my own experience that it takes about an hour, and that’s an hour working steadily at it with no breaks. That’s a lot of peas and my fingers were sore afterward. People often ask me what I do with all of those peas. Well, mostly I give them away to other people who like peas. I just eat a few of them because peas aren’t my favorite vegetable. But I will say that garden peas are much sweeter than any peas that you can buy – canned, frozen, or “fresh”. I often eat them raw straight from the pod while out working in the garden. That’s all I really have time to report in this letter. Short and sweet, and full of peas! Here’s a picture of the garden, taken on Sunday evening. It was too wet to hoe the beds Sunday morning so I just pulled the bigger weeds, including purslane. That purslane, or “pusley” as Charles Dudley Warner called it in his book “My Summer In A Garden”, can drive a gardener mad trying to keep it out of the garden beds. Any little piece left will take root and start growing, wherever you tossed it. But I’m hopeful if not optimistic that I can "out-pull" it and someday it will be but a memory. 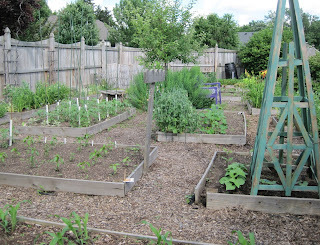 Hope reigns in the garden! That's a lot of peas to shell to not like them much. I, on the other hand, love them, but they are hard to grow here to get much. I usually eat a few steamed. My peas finished while I was in North Carolina. What a great photo - green and orange, it stands out! An hour of shelling peas sounds quite relaxing but I know that ache in the hands; thing that keeps me going is the knowledge I get to eat them, but you don't even have that! !